DonorsTrust (DT) is a 501(c)(3) non-profit started in 1999 "to ensure the intent of donors who are dedicated to the ideals of limited government, personal responsibility, and free enterprise." Along with its supporting 509(a)(3) organization Donors Capital Fund (DCF), it is a spin-off of the Philanthropy Roundtable, a coordinating body for conservative foundations founded by Whitney L. Ball, who passed away in 2015. The current president and CEO of DCF and DT is Lawson R. Bader, former president of the Competitive Enterprise Institute. Both funding organizations are "donor-advised funds," which means that the fund creates separate accounts for individual donors, and the donors then recommend disbursements from the accounts to different non-profits. They cloak the identity of the original mystery donors because the funds are then distributed in the name of DT or DCF, contributing another step to what has been called a "murky money maze." The twin Donors organizations are advertised as a way for very wealthy people and corporations to remain hidden when "funding sensitive or controversial issues," creating a lack of accountability. According to the late co-founder Whitney Ball, if donors neglect to give DonorsTrust an intent statement, "DonorsTrust is free to distribute the funds as it sees fit." 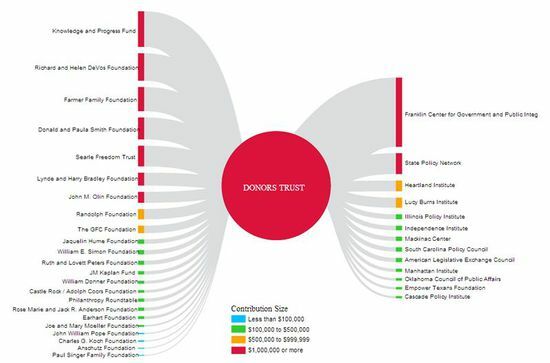 DonorsTrust is an "associate" member of the State Policy Network, a web of right-wing “think tanks” in every state across the country. Matthew Whitaker was named acting Attorney General by President Trump after the November 2018 ousting of Jeff Sessions from that role. Prior to his appointment to the Justice Department top spot, Whitaker earned $1.2 million dollars as the Executive Director of the Foundation for Accountability and Civic Trust (FACT). Whitaker's salary made up "a sizable chunk" of the organization's revenue which was "mainly from" DonorsTrust, according to the Associated Press. As the director of FACT, Whitaker was an outspoken critic of Special Counsel Robert Mueller's investigation into Russia's involvement in the 2016 election. Despite advice from ethic's officials to do so, Whitaker did not recuse himself from his oversight power into the investigation.Whitaker rejected advice to recuse from Russia probe Although DonorTrust has been the preferred investment vehicle of the Koch Network of donors, any donor, foreign or domestic, could have bankrolled Whitaker's activities. The public does not know if these secret donors may have caused conflict of interest issues for the Acting Attorney General, who has oversight over the Mueller investigation until a new Attorney General is confirmed. In June, 2016, DonorsTrust reached $1 billion in contributions to their "donor-advised accounts." For a complete list of 2010-2014 grant recipients, see the DonorsTrust and Donors Capital Fund Grant Recipients page. DT and DCF made grants of over $148 million in 2011 and 2012, and according to a report by DeSmog Blog the two funds granted almost $311 million between 2002 and 2010'. The Koch brothers and other ultra-wealthy industrial ideologues appear to be cloaking an untold amount of their donations to conservative political outlets through DT and DCF. The obscure Knowledge and Progress Fund, controlled by Charles G. Koch, with Richard Fink as president, has given only to Donors since 2005, according to Mashey. Through 2016 DonorsTrust received $3,249,292 from the Lynde and Harry Bradley Foundation. 2014: $100,000 to support the Project on Fair Representation (PFR), “which requests an unspecified amount to finance at least three class action lawsuits challenging affirmative action policies at highly competitive public and private colleges and universities, perhaps including the University of Wisconsin.” PFR’s predecessor was the Campaign for Color Blind America (CCBA). Bradley supported PFR with a grant of $100,000 in 2012 for Fisher v UT and Shelby County v. Holder. PFR was seeking help from attorneys at DC’s Wiley Rein law firm to identify more opportunities to strike down affirmative action. Bradley noted in 2014 that three likely targets were UW Madison, UNC Chapel Hill and Harvard. PFR noted a desire to file the suits within weeks or day of each other, aiming for the Spring of 2015. PFR has raised $1.5 million from the Searle Freedom Trust. William J. Hume, Director, Chairman of the Board, Basic American, Inc.
↑ DonorsTrust, Mission & Principles, organizational website, accessed December 2012. ↑ 4.0 4.1 Whitney Ball: The future of donor-advised funds, Philanthropy (a publication of the Philanthropy Roundtable), September/October 2005. ↑ Lawson Bader, Remembering Whitney Ball-1 Year Later, DonorsTrust, 2016. ↑ 15.0 15.1 John Mashey, Fake science, fakexperts, funny finances, free of tax 2, DeSmog Blog report, updated October 23, 2012, p. 71. ↑ 16.0 16.1 Connor Gibson, Greenpeace, Meet the Network Hiding the Koch Money: "Donors Trust" and "Donors Capital Fund", PRWatch.org, originally published by Greenpeace, October 29, 2012. ↑ DonorsTrust, 2017 IRS form 990, organizational tax filing, November 15, 2018. ↑ DonorsTrust, [paper copy on file at CMD 2016 IRS form 990], organizational tax filing, November 15, 2017. ↑ DonorsTrust, 2015 IRS form 990, organizational tax filing, November 14, 2016. ↑ DonorsTrust, 2014 IRS form 990, organizational tax filing, November 16, 2015. ↑ DonorsTrust, 2013 IRS form 990, organizational tax filing, November 7, 2014. ↑ DonorsTrust, 2012 IRS form 990, organizational tax filing, November 14, 2013. ↑ DonorsTrust, Directors & Staff, fund website, accessed March 2018. This page was last edited on 19 February 2019, at 22:20.